A photo of Cindi Decker holding up her painting of an egret has become the centrepiece of a viral Reddit art sensation. When Cindi Decker's son snapped a photo of her holding up her painting of an egret, she thought he was just going to send it to his friends. "He does Snapchat with all his buddies — I mean, these kids I've known since they were in first grade, so I thought that's where he was just sending it," the 55-year-old teacher from Jacksonville, Fla., told As It Happens host Carol Off. "Instead, I guess he posted it to Reddit ... I didn't know what to expect. I didn't even know what Reddit was, really." He posted the image on the massively popular online forum with the caption: "My mom painted this and said no one would like it. It's her 2nd painting." Not only did people like it — it's been "upvoted" more than 75,500 times — but it inspired others to incorporate her artwork into their own. 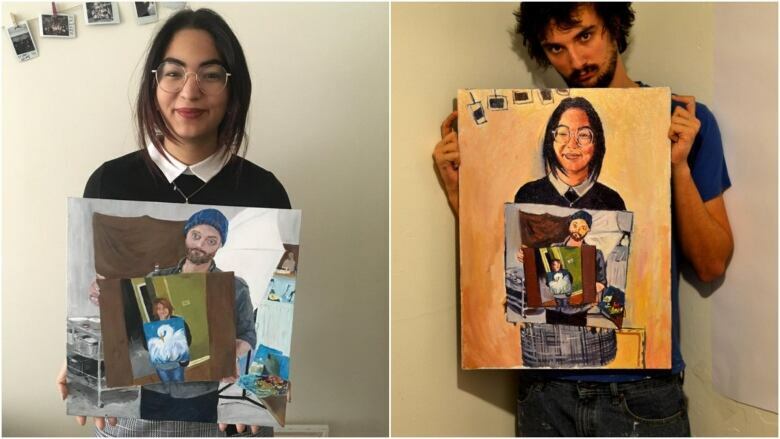 It started when Reddit user k__z, identified by the BBC as Swedish artist Kristoffer Zetterstrand, spotted the picture and decided to paint it. He then shared a picture of himself holding up his painting of Decker holding up her painting, setting off a chain reaction known as "paintception." "Then it just spiralled from there," Decker said. 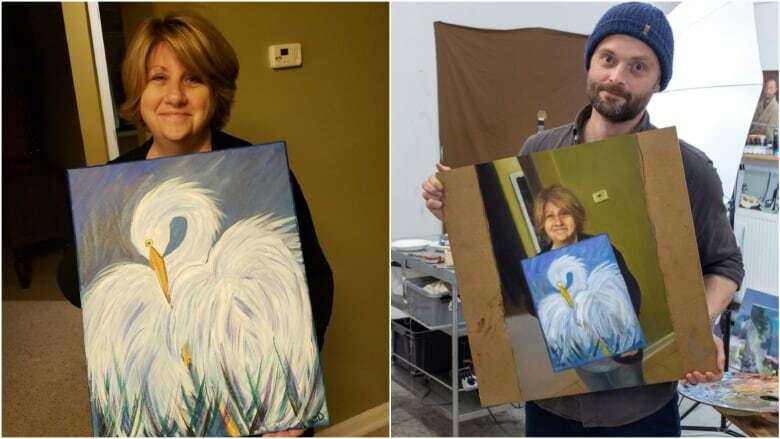 "Took a while and not perfect, but I painted the guy who painted the other guy's mom," wrote user lillyofthenight, who was then herself painted by seamuswray, who wrote "I painted the girl who painted the guy who painted the other guy's mom who painted an egret." "It's really weird," Zetterstrand told the BBC. "Last I counted there were over 40 paintings. I keep getting smaller and smaller." It's gotten so huge that someone with the online handle Nubleh posted an interactive web, kind of like a family tree, to illustrate how the phenomenon spread. Decker says the experience has been incredible. People have been overwhelmingly sweet, she said, with one person commenting that she had "kind eyes" and another calling her the "honorary mom of Reddit." "There were hateful comments there. Sometimes, you know, they attack you or they attack your painting or whatever," Decker said. "Those don't even bother me because the kind just so outweighed that." Several folks messaged her to thank her for inspiring them to make art, she said. One person told her it was the first time they'd picked up a paint brush in years. "Even though people say, 'You inspired me to paint,' I don't know that it was so much me. I really give credit to the first artist who painted," she said. "You know, I'm not a painter. I'm just somebody who went out and did a little painting thing, so I got lucky to get caught up in all this fun craziness." Zetterstrand, meanwhile, has promised to send his painting to Decker. She even joined Reddit just to "thank him formally," she said. "I'm anxious to get it and excited," she said. "It's just something fun." The whole experience has inspired her to keep painting, she said. "But I'm not going to sit there and post it to Reddit every time," she said. "I think they've had their fill of me." Written by Sheena Goodyear. Interview with Cindi Decker produced by Allie Jaynes.